The Natural Product and Food Analysis Facility is an analytical service laboratory, located at the Department of Food Science and Technology, University of Nebraska Lincoln that provides analyses as they pertain to food and other natural systems. Our expertise lies in testing natural products and foods for their exert health promoting agents, i.e., nutraceuticals, while also providing standard food analyses that range from food rancidity testing, shelf life, to proximate analysis. We also provide customized end preparation unique for every product prior to analysis and final data analysis interpretation. These services are provided to our University community, private / public companies, and the general public on a fee-for- service or contract basis. The laboratory is supervised by Dr. Vicki Schlegel who is an analytical food chemist, with research interests in nutraceuticals and functional foods. Contact: Vicki Schlegel, Ph.D. (vschlegel3@unl.edu), Richard Zbasnik (lab manager), (rzbasnik2@unl.edu). Add 15% to the price of these tests if fat has to be extracted. ** Price negotiated based on analyte(s) to be identified / quantitatated and the sample matrix. ^ Price is dependant on type and number of carotenoids to be analyzed. Prices are listed as base price but my change slightly according to food matrix and number of samples, i.e., (10 or more samples, 5-10% discount depending on test). Assays are based either on AOAC, USP, AOCS, or published methods. Prices increase 25-50% based upon turn around times expected. Typically, turn around times are 6-12 working days from date of sample receival. Tests are performed in triplicate analyses per sample (in most cases). Fiber tests or other tehcnoical tests are performed in duplicate. 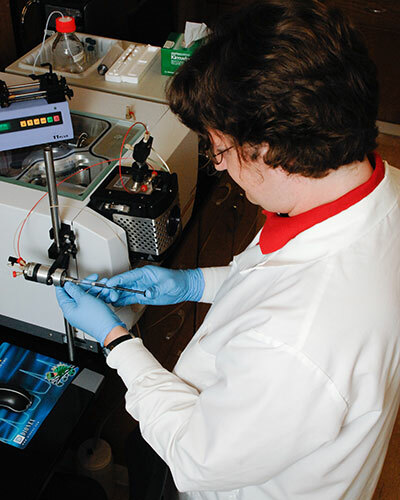 All HPLC, gas chromatography, and technical instrumental tests require at least 3 samples for analyses. Contact: Dr. Vicki Schlegel - vschlegel3@unl.edu | Richard Zbasnik (lab manager), (rzbasnik2@unl.edu).